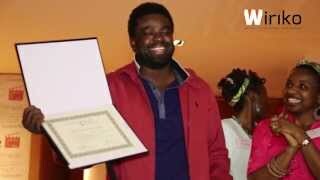 Nollywood Video News: Here's a video of popular Nollywood film-maker Kunle Afolayan, receiving an award for Phone Swap at the concluded Nollywood Week Film Festival in Paris (2013), Nigeria Movie Network is reporting. The winner in the first Nollywood Week Paris edition was 'Phone Swap' by the nigerian director Kunle Afolayan. Video courtesy Wiriko. In French: "El premio a la mejor película elegida por el público en la Nollywood Week Paris ha sido para 'Phone Swap del director nigeriano Kunle."